Dominican Sister of Peace Eileen Fallon, 82, died at St. John Neumann Nursing Center in Philadelphia on January 16, 2019. She was born in 1936 to Marie Eberle and James Fallon of Philadelphia, PA.
After high school, she worked for seven years at the Curtis Publishing Company, but as she was known to say, the call of the “Hound of Heaven” was strong, and in 1962 she entered the Dominican Sisters. She was a member of the Congregation for more than 57 years. Sister Eileen attended Villanova-LaSalle in Villanova, PA, where she earned her CCD certificate. She also earned a Bachelor of Arts in Economics from Immaculata College, now Immaculata University, in Immaculata, PA. 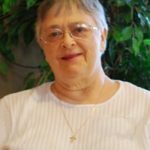 Sister Eileen was assigned to the Dominican Retreat House, Prouille Community in Elkins Park, PA, and entered enthusiastically into the Retreat Ministry. Her work at the Retreat House reinvigorated her religious life, and she enjoyed working with the retreat house staff and volunteers. 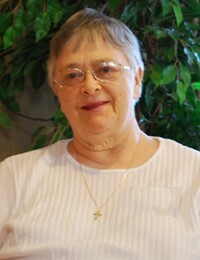 Eileen served as Coordinator of Retreats for 12 years. She worked with many retreat promoters to attract more than 10,000 women annually to enjoy the serenity and programming of events at Elkins Park. One of her favorite events was the annual Retreat for the Blind, a program that paired sighted women with non-sighted women on a weekend retreat, a project on which she collaborated with her friend, Mary Keul. Sr. Eileen brought calm and humor to any task, with the ability to juggle multiple details and projects simultaneously. When she became a Sacristan, she accepted the role with enthusiasm and continued this work until declining health forced her to retire. She retired to Philadelphia after her founding congregation merged with the Dominican Sisters of Peace. Sister Eileen was preceded in death by her parents and her siblings, She is survived by her Dominican Community and dear friend Mary Keul; also survived by sister-in-law Doris Fallon and nieces and nephews. Sister Eileen Fallon was remembered at a service on Saturday, January 19, at the Holy Redeemer Sisters’ Provincialate Chapel in Huntingdon Valley, PA. The Funeral Mass followed, and Sr. Eileen was interred at the Holy Sepulchre Cemetery in Cheltenham, PA.
To view a printable copy of this memorial, please click here. What was Sr. Eileen Fallon’s religious name.? I believe Dominican sisters received a religious name until the late 1960’s. It is not mentioned in her obituary above.